Intra-VTA infusion of the MOR agonist DAMGO produced conditioned place preference and increased DA transients. The same manipulation with the MOR antagonist CTOP also increased the frequency and amplitude of phasic DA release in the ventral striatum, despite eliciting avoidance of the conditioned context. A cocktail of CTOP and DAMGO had a robust effect on these transients yet no change in chamber preference was recorded. 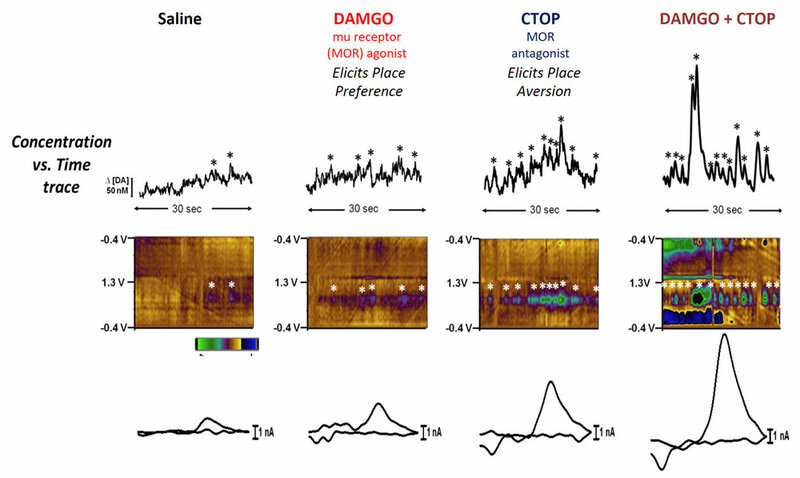 These data suggest that canonical mu mediated mechanisms modulating mesolimbic dopamine function (at the level of the VTA) do not fully describe the complexity of opioid modulation of this system.